Bill Morrison hadn’t really painted in over fifteen years, not since his final days as a student at Cooper Union in 1989. (“After Communism fell,” he muses nowadays, regarding his mindset back then, “why paint?”) But then, nor had he really needed to. Over the ensuing years, he had stumbled and then settled upon a medium every bit as evocative as paint, if not more so: decaying celluloid nitrate. Morrison began fashioning films—at first short experimental reels but presently ever more ambitious efforts, culminating in his 2002 masterpiece Decasia—out of snippets of severely distressed and heart-rendingly decomposed nitrate filmstock: decades old footage, wrested, it seems, from archives all around the country, and at the last possible moment. The sort of thing you hear about all the time from crusading preservationists understandably desperate to rescue the world’s rapidly self-immolating film heritage—a worthy goal, to be sure—but who knew the stuff was so beautiful? That decay itself—artfully marshaled, braided, scored, and sustained—could provoke such transports of sublime reverie amid such pangs of wistful sorrow? At the end of 2003, the Maya Stendahl Gallery in New York offered Morrison a solo show, at which he was able to display both Decasia and some more recent efforts on large plasma wall screens, but also some large scale silkscreens derived directly from out of the lush imagery in those films. Those silkscreens had worked quite beautifully on their own terms, though in retrospect Morrison felt detached from the process. “Granted,” he recalls, “I found and then selected and then framed the pictures, but they were based on someone else’s original imagery, in turn processed through someone else’s decay, and then fixed by someone else’s printmaking expertise, so that I ended up feeling a bit removed.” On the eve of another show at the Stendahl Gallery, in October 2005, Morrison therefore resolved to throw himself a bit more directly into the artmaking process, to put a bit more of himself personally on the line, which is to say, to return, after a hiatus of more than fifteen years (“Maya asked, ‘Can you paint?’ and I said, ‘Sure, I can paint’”) to the painting studio. And so there he sat, gazing up dejectedly at his blank canvas. Hunh, he thought. 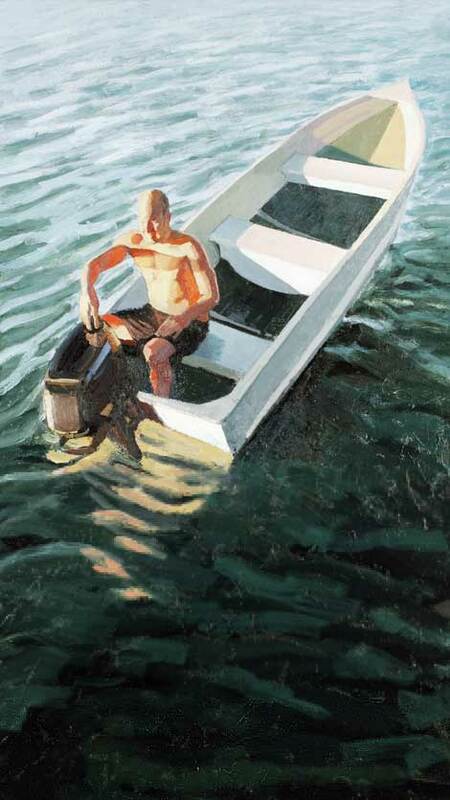 How better to jumpstart a stalled out painting project than with an image of trying to jumpstart a stalled out little boat. 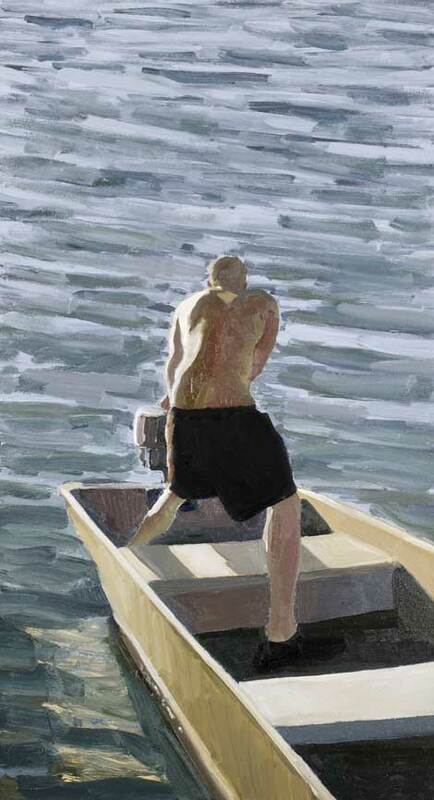 He worked quickly, one painting and then another and two others still, finishing the last on the very eve of the show: a parody of macho, a hulking studmuffin alone at sea, up the proverbial creek without a paddle, with the sun going relentlessly down. And yet a painter finding himself, the sun of his self-assurance rising just as relentlessly. The brushwork around the fading light, glinting off the water, proving particularly reminiscent of some of the liquefying imagery of decay in his films. The sequence, thereupon mounted at the Stendhal Gallery, proved eerily haunting in its own terms, but also carried a whiff of pertinence. This was after all America in 2005, adrift in Iraq, in the wake of an election where the opposition had sputtered out haplessly in their efforts to unseat the authors of that war (swiftboats, indeed), a world fast running out of fuel and up its own creek, the globe warming, the sun setting . . . .
Excursion I, oil on canvas, 2005. 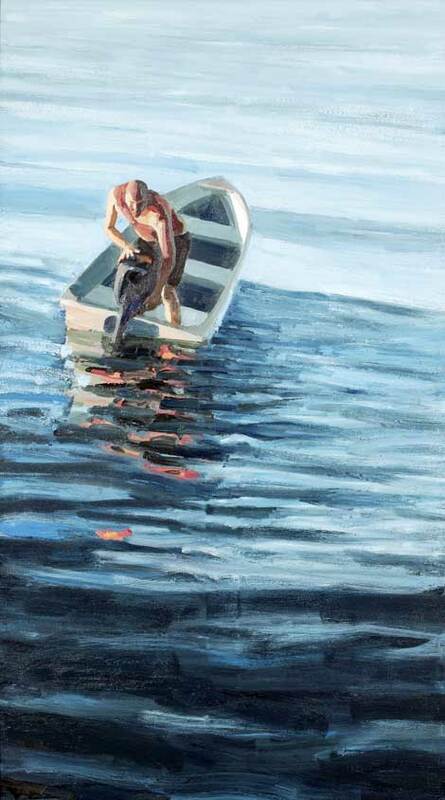 Excursion II, oil on canvas, 2005. 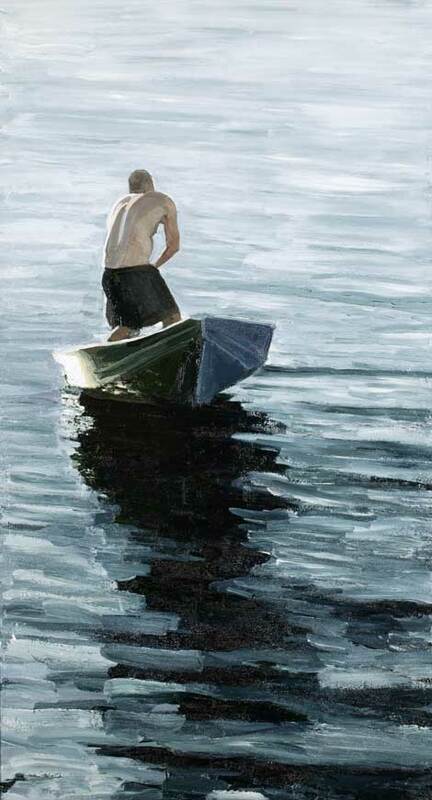 Excursion III, oil on canvas, 2005. Excursion IV, oil on canvas, 2005. All images reproduced by permission of the artist. © Bill Morrison. Bill Morrison has eight titles in the permanent collection of the Museum of Modern Art, including Outerborough (2005), Light Is Calling (2004), and Decasia (2002). A member of New York’s Ridge Theater since 1990, Morrison’s projected set work with the company has been recognized with two Dance Theater Workshop Bessie awards for excellence in theatrical design, a Village Voice Obie Award for collaborative design, and an award from the Foundation for Contemporary Performance Art. His films have been screened in conjunction with live musical performances by American Composers Orchestra, the Brooklyn Philharmonic, Bill Frisell Trio, and Wilco.